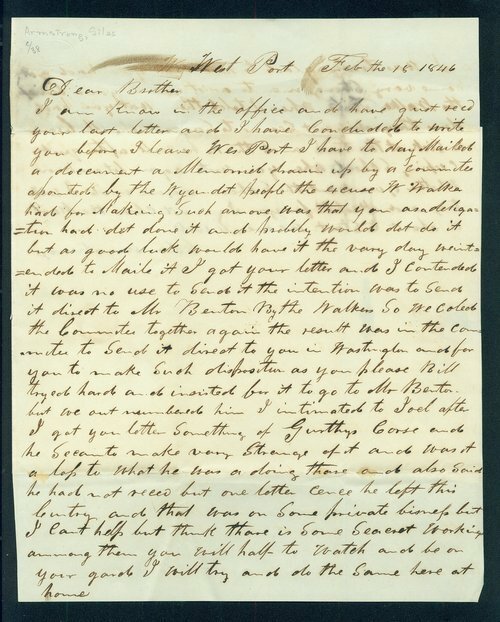 In this letter to his brother John M. Armstrong, Silas Armstrong discusses happenings among the Wyandotts while John was in Washington City on business. In particular, Silas explains that William Walker had recently undertaken certain actions while citing the fact that John "as a delegator had not done it and probably would not do it." Silas warns John "to watch and be on your guard." People - Notable Kansans - Armstrong, John M.